Dear people, we have had some problems with the event calendar on Joes website and couldn’t fill in the events for July and August. The calendar is working again and we are adding everything in the next couple of days. 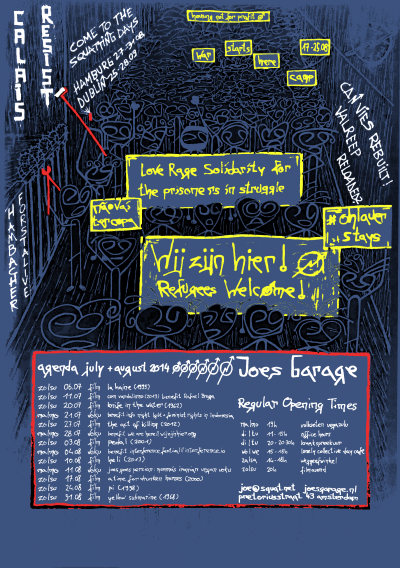 In the time being, we publish herewith just the very rough schedule for July and August. Everything will be as always except that there is no Voku on Thursdays in the summer. Instead some renovations will be done during the free days and you are welcome to participate in Joes . We will keep you updated with concrete tasks that have to/will be done in the following two months. Joes volunteer meeting every second Friday a month (11.07/08.08). Posters and flyers are also delayed but will be ready in about one week.